Considered as particularly difficult by generations of students and engineers, thermodynamics applied to energy systems can now be taught with an original instruction method. Energy Systems applies a completely different approach to the calculation, application and theory of multiple energy conversion technologies. It aims to create the reader's foundation for understanding and applying the design principles to all kinds of energy cycles, including renewable energy. Proven to be simpler and more reflective than existing methods, it deals with energy system modeling, instead of the thermodynamic foundations, as the primary objective. Although its style is drastically different from other textbooks, no concession is done to coverage: with encouraging pace, the complete range from basic thermodynamics to the most advanced energy systems is addressed. The accompanying Thermoptim (TM) portal (http://direns.mines-paristech.fr/Sites/Thopt/en/co/_Arborescence_web.html) presents the software and manuals (in English and French) to solve over 200 examples, and programming and design tools for exercises of all levels of complexity. The reader is explained how to build appropriate models to bridge the technological reality with the theoretical basis of energy engineering. Offering quick overviews through e-learning modules moreover, the portal is user-friendly and enables to quickly become fully operational. Students can freely download the Thermoptim (TM) modeling software demo version (in seven languages) and extended options are available to lecturers. 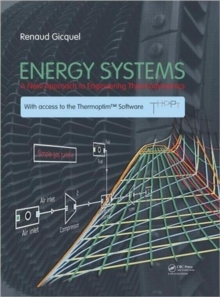 A professional edition is also available and has been adopted by many companies and research institutes worldwide - www.thermoptim.orgThis volume is intended as for courses in applied thermodynamics, energy systems, energy conversion, thermal engineering to senior undergraduate and graduate-level students in mechanical, energy, chemical and petroleum engineering. Students should already have taken a first year course in thermodynamics. The refreshing approach and exceptionally rich coverage make it a great reference tool for researchers and professionals also.